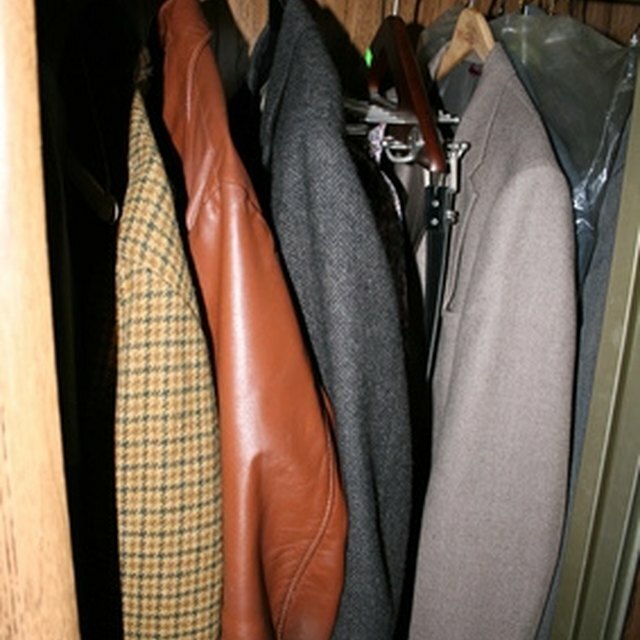 An well organized closet is priceless. Professional closet systems can cost thousands of dollars, but organization doesn't have to be expensive. Use your imagination, a quick trip to the dollar store and a few tips to make a big difference in your closet without spending much money. Remove everything from the closet. Deep clean the closet. Dust, vacuum and paint, if necessary. Invest in a single type of hanger. This gives your closet a uniform look and displays the clothes without the distraction of mismatched hangers. Plastic hangers in packages of 10 or 15 are available at discount and dollar stores for only $1 per package. Purchase inexpensive hanging and shelf storage units to hold sweaters, shoes and other items you regularly wear. Discount stores carry a selection of this type of item. Think vertical. A hanging sweater bag creates storage where there wasn't any before. Buy clear containers so that you can easily see what's inside. Purchase one hanging sweater rack and one hanging or back-of-the-door shoe rack -- more if your closet has the room for them. These units cost about $10 each at discount or dollar stores. Hang a small, accordion dowel rack on the wall to hang purses, scarves or jewelry. You should be able to find one for about $5. Add a dirty clothes hamper in the corner if your closet is large enough for this. Place a colorful basket to catch miscellaneous odds and ends. Replace your garments in your closet, using your new hangers and storage units. Replace only the items you have worn in the past year. Throw away garments and shoes that are long past their best days. Place anything else that you are hesitant to give away in a cardboard box and label the contents, along with a date, on the box. Put it in the attic or basement. Maintain the closet by hanging up your clothes every day. If you never toss something on the floor, you won't find yourself back in the same mess again next year.